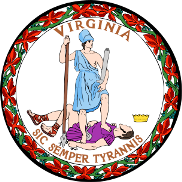 The State Flag of Virginia on its dark blue field depicts an image of the seal of Virgina. The image on the seal is Virtus, the Roman goddess of bravery and military strength. The flag serves as a symbol of honor, heritage and regional pride and is displayed at state buildings. The Virginia State Flag is also flown on national and state holidays and on any other days proclaimed by the governor. There is an Order of Precedence for flags. State Flags are displayed in order as they entered the Union. Car Flags are often displayed to represent of an individual's allegiance to their state. Virginia State car flags are used by their owners as mobile emblems of their home. Car flags and are usually made from strong materials and are attached to a car via a pole and clip window attachment. What is the design of the Virginia state flag? Who does the central, standing figure symbolize? The masculine stance leads people to believe at first glance that the figure is a man but it is, in fact, a representation of the Roman goddess Virtus. 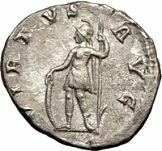 In Ancient Rome the Goddess Virtus was usually depicted carrying a sword and a spear and wearing a helmet and she symbolized character, worth, and courage. Virtus was the goddess of bravery and military strength and represents the spirit of the citizens of the Commonwealth of Virginia. In this depiction she continues to carry a sword and spear and has clearly been victorious in battle against the man lying at her feet. The now worthless whip in Tyranny's right hand represents Virginia's release from the British acts of chastisement such as the Intolerable Acts. The image is surrounded by a border design of Virginia creeper. The ratio is 7:11 meaning it is 7 units tall for every 11 units wide. Who designed the Virginia State Flag? What is the history of the Virginia State Flag? The Virginia flag is kept and used as required by the code specified in the constitution of the state.